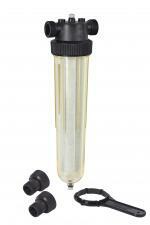 Manual cleaning filters: these filters are quick to clean, with no need to remove the filter mesh. The filter cartridge is backwashed and brushed manually to remove pollution accumulated during the filtering process. Automatic self-cleaning filters: The principle is the same as for manual cleaning, but the cleaning is motor-powered and carried out either at a selected time interval (between 2 and 48 hours, depending on the model), or by measuring the pressure drop across the filter (cleaning activated for a drop of 0.5 bar). Empty filters (without filtration cartridge). - Transparent filter holder in acrylonitrile styrene. - Working pressure: 0 - 10 bars (bursting: 30 bars). - Water temperature: 5 - 35°C. 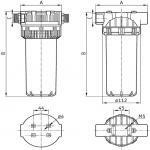 - Female 3/4" - 2" inlet/outlet. - Integrated air bleed (screw) in the head. - 1/8" female inlet/outlet pressure gauge sockets. 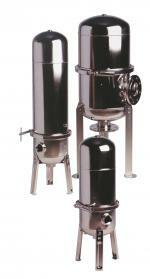 - Very high-flow filters with cyclonic effect centrifugal pre-filtration. 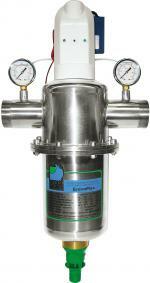 - Flexible 25 micron polypropylene mesh filter. - Working pressure: 1.5 -10 bars (recommended: 4 bars). - Maximum pressure: 16 bars (bursting: 50 bars). - Maximum instantaneous flows: 6500 l/h (1" 1/4), 20000 l/h (2"), 25000 (2" 1/2), 30000 l/h (3"). - Water temperature: 5 - 50°C. - Recommended water quality: 14° dH - Class 3 (or 25°F). - Inlet / Outlet via screw-type male brass sockets with flat seats and sealing via flat gaskets. - The visible part can be dismantled for changing the flexible pocket filter. 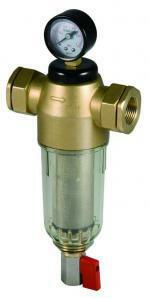 - Filters equipped with 2 pressure gauges (517630, 517645, 517660). - The filter must be connected to a water outlet equipped with a disconnector. Filtering principle : very high rate filtering of cold and hot water, to eliminate solid impurities in suspension in the water. The filter rating is determined as a function of impurity particle size. The impurities may be : organic matter, sand, gravel, algaes. 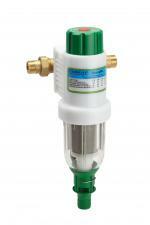 Filtering principle: cold or hot water is filtered to remove solid particles in suspension in the water. The filter will be rated as a function of the pollution particles size.Pollution may be: organic matter, sand, gravel, algaes.